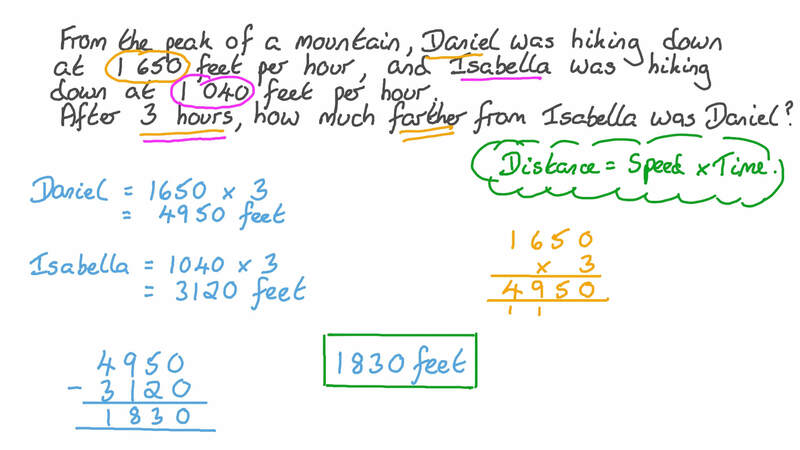 In this lesson, we will learn how to apply multiplication of positive and negative integers in evaluating algebraic expressions to solve real-world problems. Suppose the temperature outside drops 2 ∘ C each hour. Determine the change in temperature in 9 hours. 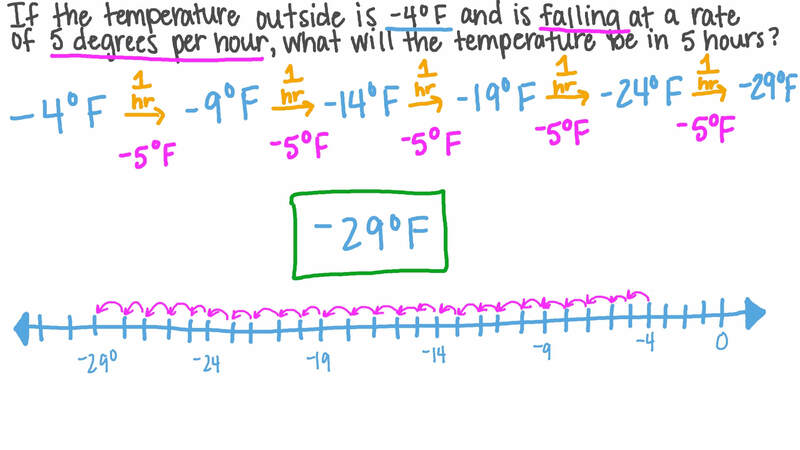 If the temperature outside is − 4 ∘ F and is falling at a rate of 5 degrees per hour, what will the temperature be in 5 hours? 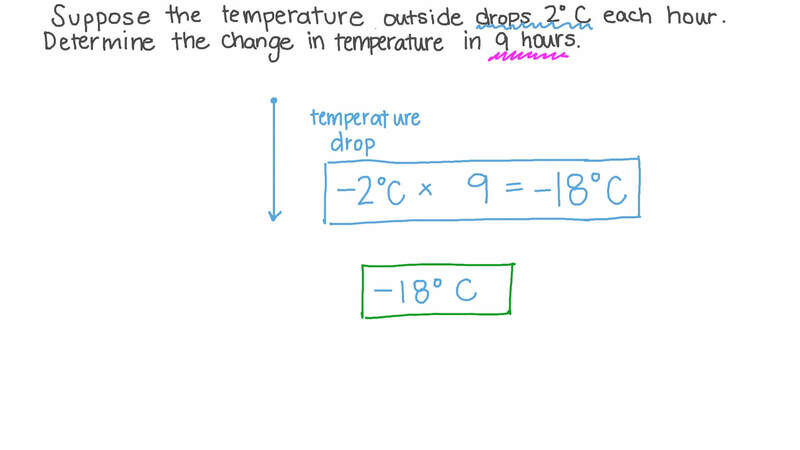 If the temperature drops 2 degrees per hour for 5 hours, which of the following expressions does not describe the change in temperature? Sameh goes to the gym every day. When he does cardio for 1 hour, he burns 575 calories. If he does cardio for 3 hours, write a multiplication expression to represent that situation, and then find its product. Given that a submarine is descending below the sea level at a rate of 60 feet per minute, determine the depth at which the submarine will be after 10 minutes. From the peak of a mountain, Fares was hiking down at 1 650 feet per hour, and Nada was hiking down at 1 040 feet per hour. After 3 hours, how much farther from Nada was Fares? If, for each kilometre above Earth’s surface, the temperature decreases 7 ∘ C , what would the temperature be 11 kilometres above Earth’s surface, given that the temperature at the surface is − 1 1 ∘ C ? The elderly population in a town is decreasing at a rate of 32 residents per year. If the rate stays the same for 6 years, determine the change in the town’s original population. Two students were trying to evaluate the expression 𝑎 𝑏 − 𝑐 , given that 𝑎 = − 1 0 , 𝑏 = 6 , and 𝑐 = − 2 . The first student believed the answer to be − 5 8 , while the second student believed the answer to be − 6 2 . Which of the two answered correctly? Dalia invested some money on a stock, and she loses $7 every day. Determine the change in her investment after seven weeks. A construction company dug a hole for a new underground parking garage. The workers dug 6 feet every hour for 6 hours. Express the position of the bottom of the hole in relation to the surface as an integer. Sally pays $190 for rent every month and $480 for mortgage twice a year. Write an expression involving multiplication and addition to describe how these expenses affect her bank account balance on a yearly basis, and then evaluate the expression. Engy made eight $95 withdrawals from her bank account in the past week. Given that she never made any deposits, determine the amount she has in her account now in relation to the amount she had at the beginning of the week. Which property of multiplication of integers is being used in the following expression ℤ : − 2 × ( 4 × 6 ) = ( − 2 × 4 ) × 6 ? The elderly population in a town is decreasing at a rate of 40 residents per year. If the rate stays the same for 9 years, determine the change in the town’s original population. A construction company dug a hole for a new underground parking garage. The workers dug 6 feet every hour for 10 hours. Express the position of the bottom of the hole in relation to the surface as an integer. Yara made twelve $30 withdrawals from her bank account in the past week. Given that she never made any deposits, determine the amount she has in her account now in relation to the amount she had at the beginning of the week.